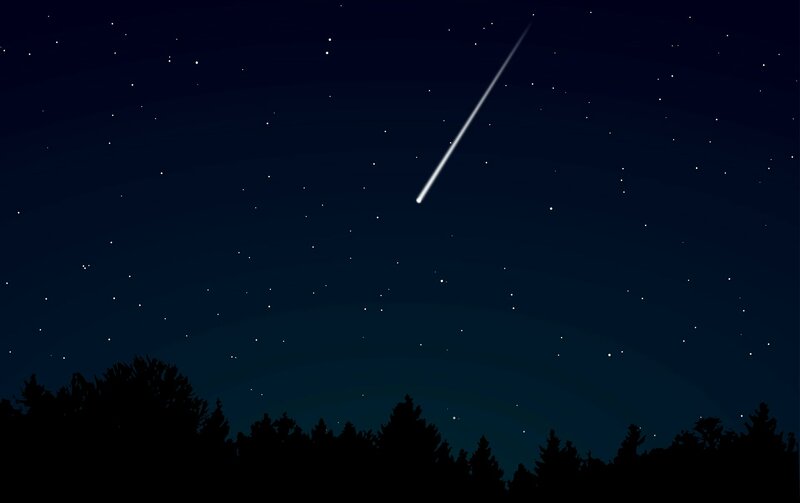 A shooting star is a metaphor to describe the amazing natural miracle of electromagnetic radiation triggered by the chemical interactions among molecules. Let's get started to inspect a shooting star which is brighter than any fireworks made by humanity. Most of the time, a shooting star is a misconception due to its brightness. The reason is as follows. When a shooting star passes through the atmosphere, its outer layers are starting to burn and vaporize because of the high temperature, consisting of mostly dirty ice. The ignition of the outer layers stimulates chemical reactions and therefore cause air molecules to radiate electromagnetic radiation as a reflection to the high amount of energy produced by the interaction between the outer layers and the atmosphere. In other words, a shooting star is, actually, an object coming from the deep space, such as grains composed of ice and interplanetary dust. These incandescent grains are much too small to be visible for human eyes, but the atoms that evaporate from their surfaces strike air molecules, causing these to produce flashes of light, and that is the bright glow(1) that we see as shooting stars. As explained in diverse resources, a shooting star is one of the most known celestial phenomena among ancient cultures. However, it is an intriguing fact that all the feared shooting stars were just a tiny, little interplanetary dust grain. (1) Bely, Pierre-Yves, Christian, Carol, and Roy, Jean-René. "What is a shooting star?." A Question and Answer Guide to Astronomy. Cambridge: Cambridge University Press, 2010. 111. Print.